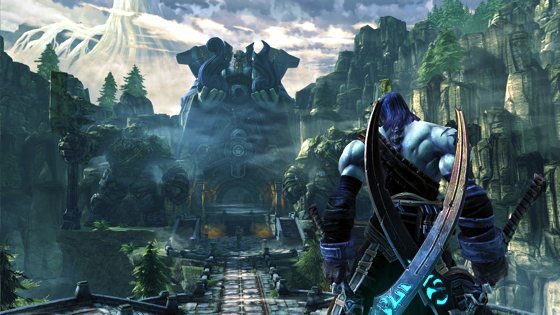 Darksiders II Wii For newcomers to the series, Darksiders II provides a satisfying gaming experience on the Nintendo Wii U. With fun gameplay and lots of challenges to be found along the way, the only thing holding back the title is the frame rate and loading times that can sometimes be an issue. 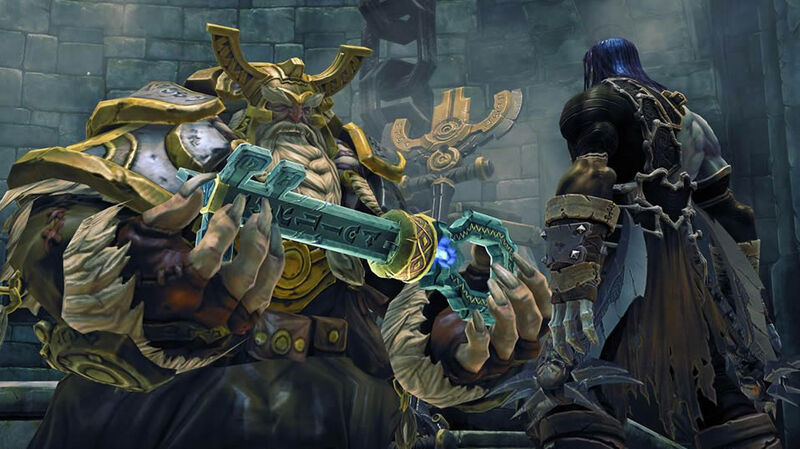 Although Darksiders II has been available on the PC, PS3 and XBox 360 since mid-August 2012, it is actually the Wii U version that the developers have probably spent the most time perfecting due to the innovative new gaming controls in this action adventure game. In essence, the story is almost identical to the previous gaming platforms, however the Wii U version includes the awesome new GamePad to give the player a few new tricks up their sleeves. Another highlight of the Wii U is that it contains an additional 5 hours of gameplay, more specifically with the inclusion of Argul's Tomb that is a fun add-on. 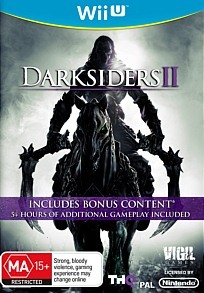 If you don't know by now, this is sequel to the original game and Darksiders II actually runs in conjunction with this story so new players are not penalised. However if you did play the original, the story does feel more fleshed out and compelling. In the original game, War was wrongfully accused of setting in motion the events that would lead to the destruction of mankind. As a result, War's brother Death has vowed to clear his brothers name that leads him on an amazing journey of violence and redemption into another world. The first chapter of the game serves as a tutorial that teaches the gamer combat, navigation (e.g. running up walls) and the RPG aspect of the title. It's definitely a much needed tutorial, especially on the Wii U.
Reminiscent of game such as God of War and the Devil May Cry but considerable more freedom such as The Legend of Zelda, Darksiders II is an action packed journey that is not only over the top in nature but actually fun to play on the Wii U. Like the aforementioned game God of War, Death is a dual-wielding warrior who has a primary and secondary weapon of different speeds. As you cut and slash your way through victory, there are plenty of puzzles to be found along the way, including some truly epic boss battles. There are also heaps of coins and chests to find in the game that at times makes the game seem like a Mario game. However if you can pry yourself away from collecting goodies, the game is quite in-depth and really engages the player. The original game was accused of being quite linear and to an extent it was but in the sequel, the gaming environment seems considerably larger that assists in the illusion of freedom. Making your way from point A to B is assisted by your trusty steed Despair which helps you navigate this gigantic world. Unfortunately you can't ride him everywhere. Combat in the game is a combination of button mashing meets combo attacks and there is some skill involved. As you progress, so do the skills and weapons of Death which is definitely a highlight of the game. Death has access to some impressive spells and morphing abilities plus a creature called Dust that points the gamer in the right direction should you get stuck. Gameplay is quite smooth. The Wii U version of course boasts the GamePad and it is a little bit disappointing that the developers didn't implement this new control system better into the game. For the majority the GamePad works just like a large DualShock or 360 controller and combat, movement and interaction with the gaming environment works flawlessly. Where the GamePad does shine is through the touch screen on this controller which allows you to easily access your skills and inventory. It is definitely far superior than accessing the menus in the other versions. It actually streamlines the gameplay. 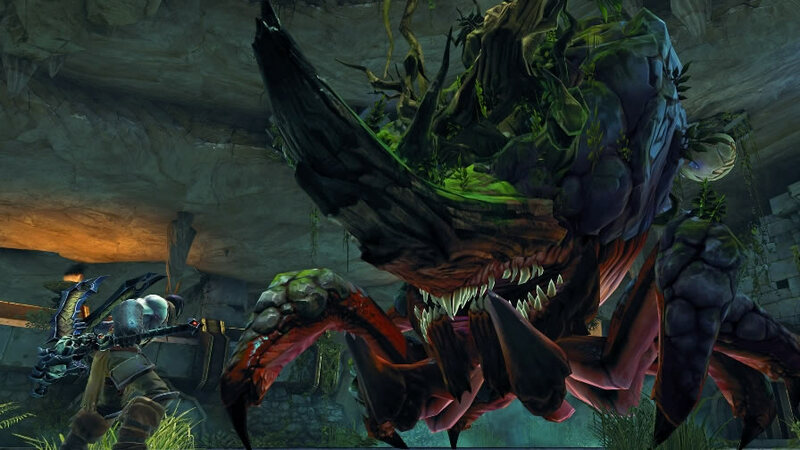 Graphically, Darksiders II on the Wii U look equally as impressive as the other formats but unfortunately, the frame rate suffers as do the lengthy loading times. 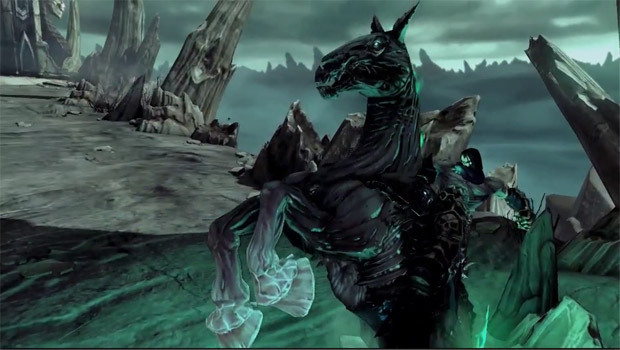 Death and his horse Despair are animated well with some awesome texture details as are the other characters that you encounter. The game animation is quite smooth and some of the backgrounds are very impressive. Audio booms through surround sound and the voice acting, although very very clichéd suits the premise of this comic book inspired world. Music and sound effects compliment the strong gameplay well. 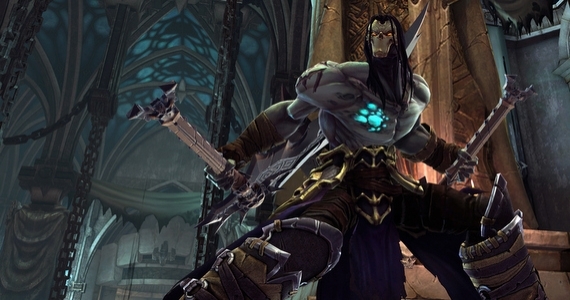 For newcomers to the series, Darksiders II provides a satisfying gaming experience on the Nintendo Wii U. With fun gameplay and lots of challenges to be found along the way, the only thing holding back the title is the frame rate and loading times that can sometimes be an issue. However most of these can be forgiven, especially when you are finding new weapons and powers as you search the land for a way to vindicate your brother.